I don’t know what correlation you want to draw from this but I found the above chart interesting. Although there appears to be some obvious correlations. the higher income due to higher SAT scores could be for numerous reasons other than “I scored better on the SAT so I I got a better job and make more”. 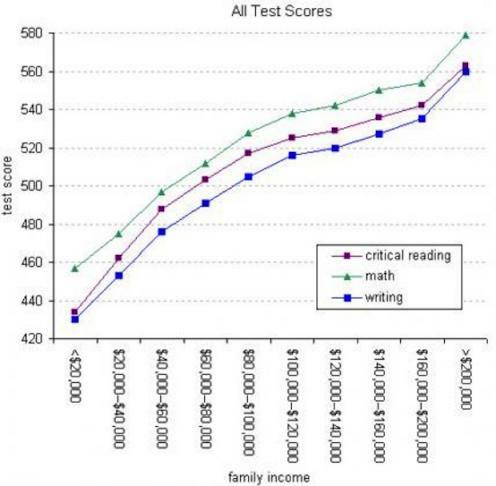 One correlation is they are measuring family income and I would imagine people who scored higher on their SATs met other people who scored higher on their SATs in college and social gatherings. I’m also not sure the SAT is a good measurement for what makes a person successful in the world but maybe it is? Then again maybe I’m just jealous of all those smart rich folk! I’m still waiting for the money vs. perceived happiness chart to come out.